Full One Year Warranty! Fast Fast Shipping! Fast Intel Core i5! 1 Year Warranty! Fast Shipping. Fast Intel Core i3! Free Shipping. 1 Year Warranty! Fast Shipping! Our computers our refurbished to factory specs and function as they would when new. Each part is tested individually for full functionality before being installed or used in a computer or laptop. What product keys are included with computer?. Includes computer and power cord only. No monitor, keyboard, or mouse. Very good used condition. Tested and working. One small scrape on the front panel. Excellent Cosmetic! 1 Year Warranty! Intro Price! Limit 1! 1 Year Warranty! 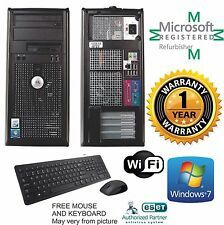 Dell Vostro 230 Desktop 2.93GHz C2D E7500 3GB RAM 320 GB 7200rpm Hard Drive. Condition is Used. Shipped with USPS Priority Mail. Fast Intel Core 2 Duo Processor! 1 Year Warranty! I7 2600 Quad 3.40GHz 16GB Ram 1TB "NEW" Solid State Drive CD/RW DVD-ROM Win 10 HP 64 installed. 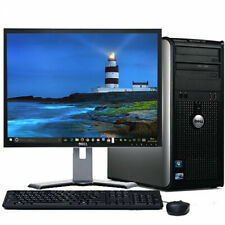 FAST Dell Optiplex 990. OptiPlex 990PC DESKTOP COMPUTER Network Card PC DESKTOP COMPUTER. Note: No promotional Product or software designed to slow performance of your Dell PC. 4GB RAM, 500GB HD, DVDRW, Windows 10. Mid Tower MT. FAST Dell Optiplex 9010. 2TB Storage HD. 120GB SSD 2TB Storage HD. i7 2600 Quad 3.40GHz 16GB. 120GB Solid State Drive Win 10 HP 64 installed. Tower PC DESKTOP COMPUTER. Note: No promotional Product or software designed to slow performance of your Dell PC. Dell 7010 SFF PC Intel Core i5 Win 10 hp 64 120GB SSD 3.20ghz 8gb+MONITOR 20"
Dell OEM Installation CDs Included (Includes NEW 20" Monitor). Don't be fooled by Original Manufacturer (ex. Dell) disks. WINDOW FACT Item specifics: You will get 1 unit. o Windows 10 Professional 64bit. Fast Core Intel i5 Processor! Ships Fast!